The legend of Saint George and the dragon is true. Nick Medea is living proof. Over 1,600 years ago, devout Nick, then known as Georgius, slew the dragon but with disastrous results. Unbeknownst to Nick, the dragon had been charged with a solemn duty; to guard the Gate to the realm of Feirie and keep a balance between the two worlds. Through a twist of fate, Nick also died, but rose from the dead an altered man. In fact, Nick and the dragon's aura merged, forging an uneasy alliance, with the mind of the dragon continuously struggling for control while providing Nick with its powers. The ever shifting Gate has settled in prohibition-era Chicago, some fifty years after the Great Fire, amidst the backdrop of rival gangs and corrupt police. Together Nick and the dragon, continue to guard the Gate by tracking down and destroying any unwanted intruders from among the dangerous denizens of Feirie. Although he keeps a vigilant watch, shadow folk have begun to creep back into the human realm. Nick, with the help of shadow-piercing dragon sight and a magical sword given to him by the Lady of Feirie, rids homeowners of their lethal houseguests. Nick, in his role of paranormal detective, receives a call for his special brand of assistance from executive Claryce Simone. He is devastated to learn that Claryce is the reincarnation of the woman he has loved over and over again through the centuries, but has never been able to save. Through his interactions with Claryce, Nick realizes that he is facing an extremely powerful foe and he, along with his supernatural companions, must prevent a diabolical creature of Feirie from opening the Gate once and for all. Richard A Knaak's urban fantasy has a gritty, noir feel that sets a great tone for his story. His use of the many colloquialisms of the era, such as duck soup, copacetic, and the cat's meow, gives the setting an authentic feel. Also inspiring is the pairing of Nick and the dragon. I love that Nick happens to be Saint George and that he and the dragon he slew must somehow coexist in Nick's body. The story is told from Nick's POV with some interesting jumps when the dragon takes control. There are some instances that really shine as the two struggle with the circumstances of their past and their very real trust issues. Problematic is the fact that the story is told from Nick's POV, but I didn't feel there was any real character development. Although Nick is interesting, I found him to be neither likable or relatable; the fact that he was still holding a grudge about a betrayal that took place 1,600 years previously seemed excessive. Most of the other characters in the story were one dimensional, especially Claryce, the strong-willed damsel in distress. The monotony of her inevitable refusal to listen to Nick's warnings and his constant struggle to keep her safe annoyed me. More exasperating was that her behavior seemed only to endear her to Nick, making him believe she was somehow superior to her predecessors. I felt her only raison d'être was to keep the action rolling at a steady pace and to provide Nick with a level of danger that wouldn't have occurred if she wasn't along for the ride. Although the plot is intriguing, I felt the execution left something to be desired. I had a problem with the fact that Nick and his allies were constantly chasing bad guys from one part of town to another. It dragged out the action and served no real purpose. The idea of Saint George working with the dragon to fight nefarious beings from the world of Feirie is a wonderful and original idea. The final showdown was exciting and Knaak's plot points did come together in a satisfying conclusion. Parts of Black City Saint were terrific but in the end, the lack of character development left me underwhelmed. 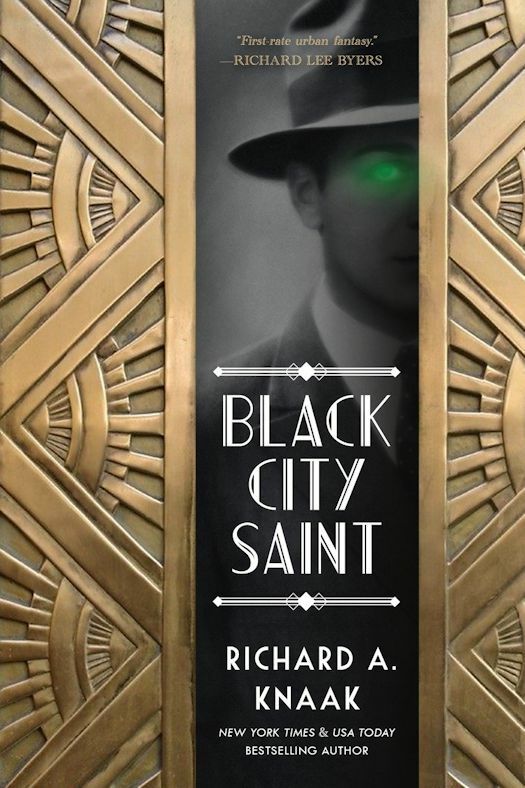 Overall, Black City Saint will appeal to fans of paranormal noir who like their adventures action driven.